1.????? ?More is not always best- When I first started my Etsy shop. I thought having tons of different colors and design styles for my painted wood sign shop would really give me an edge. What I found was that I attracted a range of different buyers, whom would then request custom orders all of which were vastly different from one another. I now know that simple is better, I stick to a singular color pallet and use only a handful of different design styles but all are cohesive with one another. It is now very rare that I get an email where someone is requesting me to make something outside of my wheel house. This is because potential buyers know and understand my design style before ever contacting me. Simply because it is apparent in the work that I am putting out. 2.??? It?s OK to say no. After several years of running my shop, I often get asked to do custom work, giveaways, whole sale opportunities, and features for other bloggers, brands, and companies. I have found that many of these opportunities are not the right for me and my shop, and it?s perfectly OK to say no. Time is precious and there is no point in wasting my time and energy on opportunities that aren?t going to further the vision that I have for my shop. Not every opportunity is a good fit for my shop’s brand and I never hesitate to let someone know this. It would be a waste of not just my time but theirs as well to entertain a lead that’s not a right fit. If I get a lead I always do my research first before making any decisions. I find that the majority of all the opportunities that I am presented with can be ruled out or approved simply by taking a look at their website and seeing if our styles are in line with one another. I have also found through trial and error that not all brands and niches’ work well for my products its OK to say yes if you ?think? it may be a good fit but if it doesn?t pan out the way you had hoped in the end you have learned a very valuable lesson; that it?s better to say no to a similar opportunity in the future. I know through trial and error that marking with “farmhouse style” bloggers works great for my brand but “life style bloggers” are not the right fit. 3.??? Ask for help before you need it. This was a very valuable lesson that I honestly learned the hard way. I am still really stubborn about this because I want to ?do it all myself? but hiring the right help at the right time actually allows me to be able to do more while also earning more even while paying an employee. The holiday is a very busy season for my shop and I usually start putting out feelers in the summer so that I can bring some helpers on before the thick of the holiday season. This also gives me some time to train them before we are in the throes of the crazy holiday orders. 4.???? Know the value of your work. There is a very fine line between over and under selling your products. This can also best discovered through trial and error. I now charge nearly double what I used to charge for similar products 2 years ago. This is for several reasons, the quality of the work I’m putting out and the products I am using to make them is much better. I can justify the rise in cost simply for these two reasons. But the main reason I also have upped my prices is because the demand was greater than the quantity of products I was physically able to put out. Every time I have raised my prices I have thought ?OK this is it no will buy my products now because they are priced too high? Thankfully these doubts have been proven wrong every time and the buyers still trickle in just the same. I have slowly raised my prices over time by 1-2 dollars each instance. I think this gradual increase has helped to not turn away very many buyers. You must however keep your head on straight and not let your success inflate your ego & become greedy.? Perhaps the buyers are still trickling in but if your products are not worth what you are selling them for this is not only dishonest but your reviews will eventually begin to reflect this. Don’t be afraid to reel it back in and drop your prices. If you’re not sure if your shop is ready for a pirce increase start by raising them just a dollar or so and see how your buyers react, if the sales stop cold go back to your original prices if the orders still trickle in you can rest assured your prices are working. 5.??? It?s OK to invest in your shop: After you have set up shop and made a few sales and proven that there really are buyers for your products, its time to make some small (or perhaps not so small) investments into your shop. This will vary depending on the type of shop you have but these investments will help give you an edge over other sellers, perhaps it will mean better equipment or tools such as a sewing machine that works more efficiently creating more time and less hassle, or perhaps it means upgrading the wood you are using for your handmade goods, or investing in better packaging. Whatever this investment is big or small even if it pains you to make it, your shops reviews and sales will certainly begin to reflect these investments and the return will be seven fold. 6.? Get on social media early and find the right platform for YOUR shop: When I first launched my shop we instantaneously set up a Facebook page. I learned very quickly that my buying audience was not translating from my Facebook page. over a year after starting my shop I started an Instagram page and it has been a complete game changer. It doesn’t matter how old or young you are social media is priceless for helping you promote your shop and anyone can learn the in’s and outs of each different platform to become successful. The key ingredient is just being consistent and learning to network within your niche. I now operate my shop completely differently because of the loyal following I have found through Instagram. It has helped me to better understand my buyers and in return make products that reflect their needs and wants while also staying true to what I love and why I started this shop to begin with. 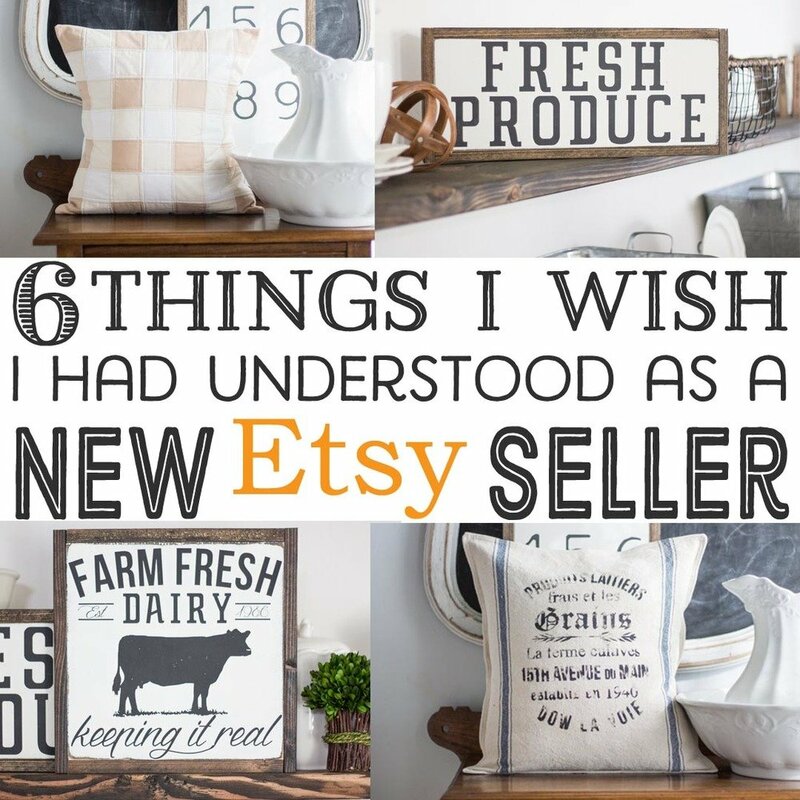 I hope you found these tips insightful and if you find yourself new to Etsy or you are just not having the success you set out for,? perhaps you can take one or more of these tips to heart and make actions to help grow your shop and be more successful starting today. I live and breath the phrase “Just start” I hope you can just start today and make your shop even just a little better than yesterday!! – Disclaimer- This post contains affiliate links, however all recommendations, ideas, and reviews in the above post are purely my. These links allow me to keep providing you free information on how to grow and expand your Etsy shop!